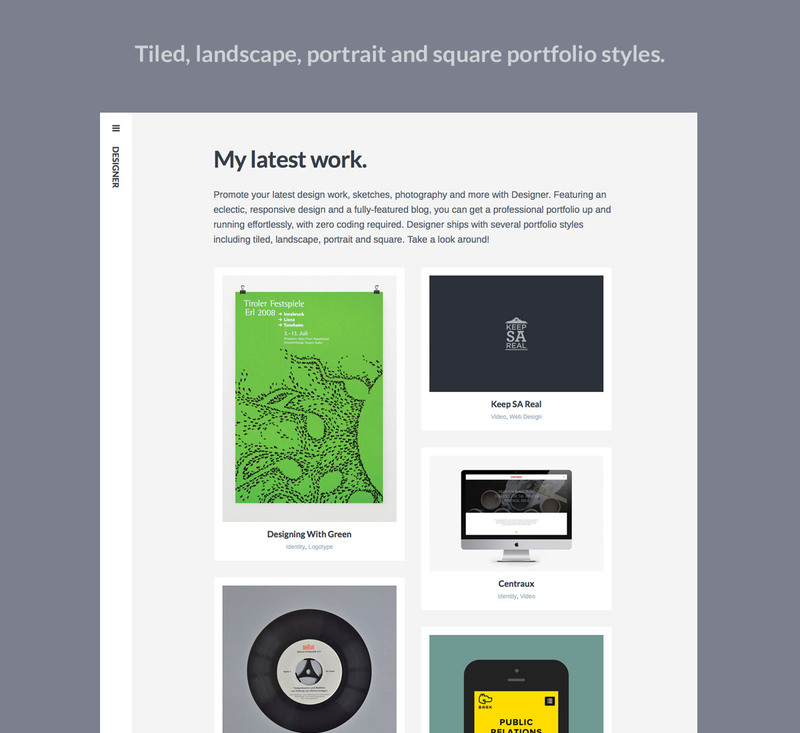 Build a beautifully simple and responsive portfolio. 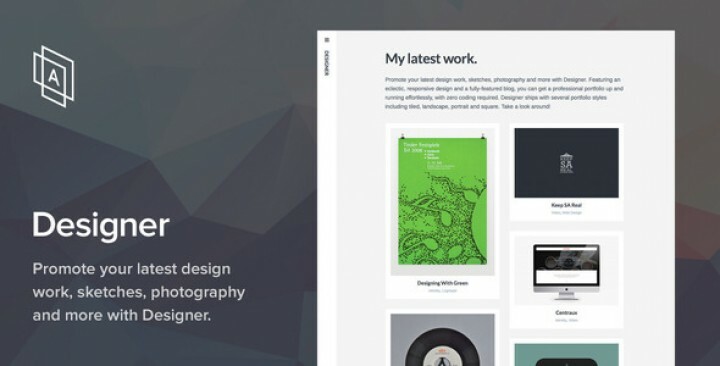 Promote your latest design work, photography, artwork, and more with Designer. Featuring a minimal, responsive design, Designer gets your portfolio up and running effortlessly, zero coding required. 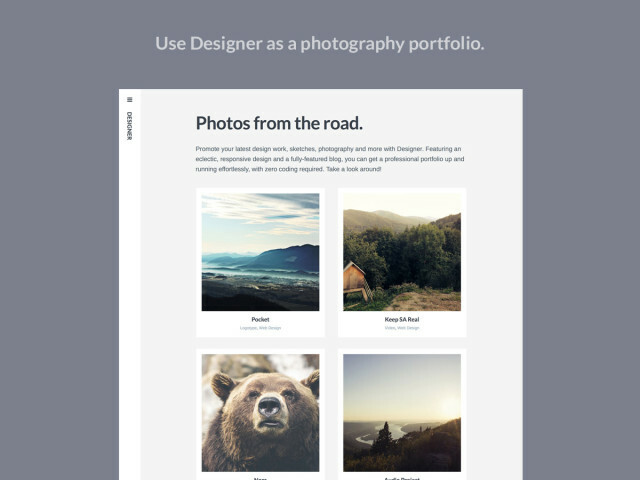 Designer is perfect for photographers, graphic designers, artists, videographers, and students. Using a mix of images, galleries and video, you can easily create an impressive portfolio showcasing your latest and greatest work. Designer ships with several portfolio styles including tiled, landscape (4:3), portrait (3:4), and square (1:1). 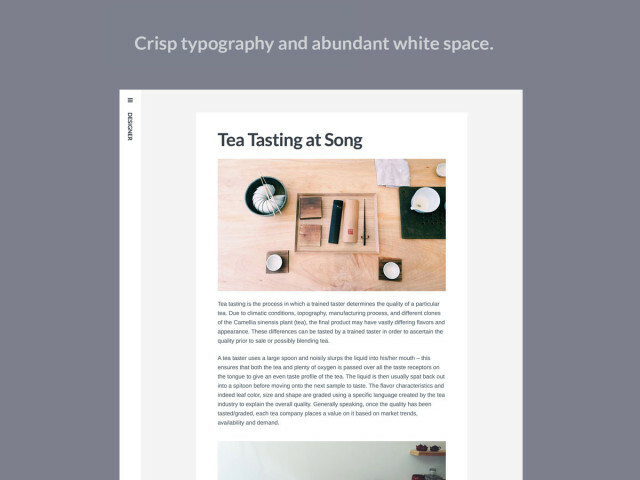 We’ve provided support for all media types so that you can create a portfolio layout that best highlights your work. 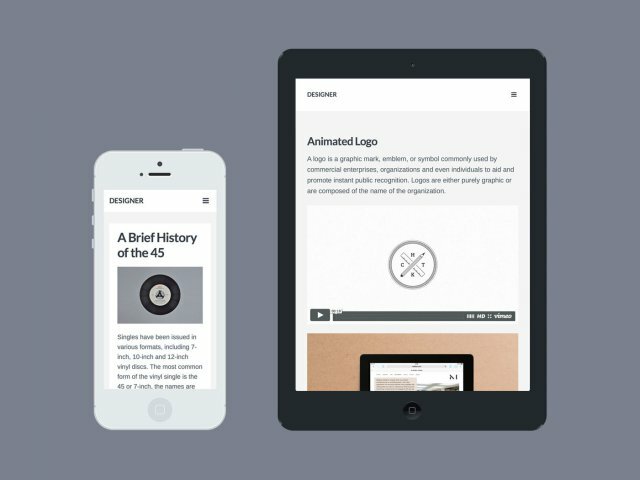 Designer was crafted for all screens, from desktop to mobile and every device in between. Images, text, galleries, and video scale down gracefully for a seamless mobile browsing experience. Designer tucks away distractions so visitors and potential clients can focus on your content. Responsive site navigation, social links, and widgets are available via a slide-out sidebar, which can optionally be set to always show. Designer’s typography has been carefully curated for bold, attention-grabbing headlines, and crisp, legible paragraph text. The attention to typography carries over to tablet and mobile devices to ensure your visitors are getting a beautiful experience no matter how they browse. Customize Designer to match your style! 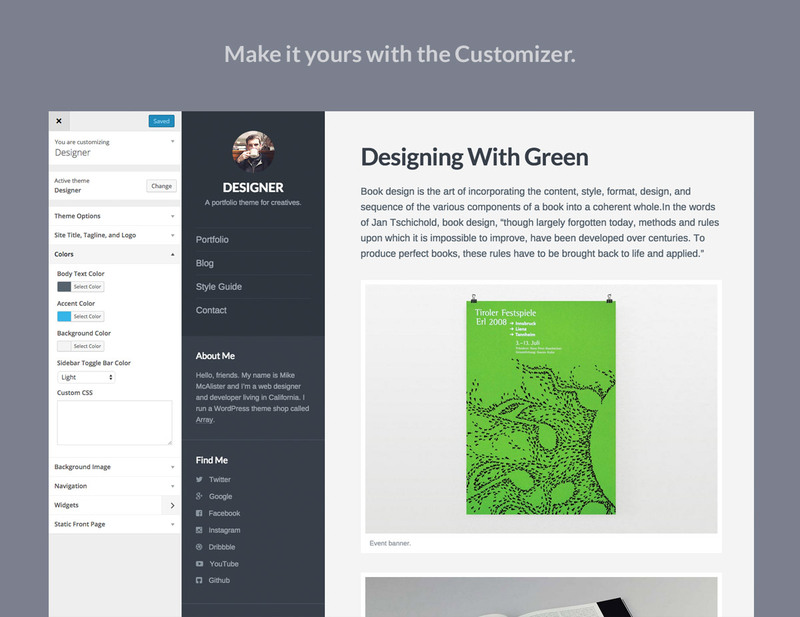 Using the Customizer, you can make real-time customizations to your site. Choose an accent color, upload a logo, add custom CSS, choose between light and dark sidebars, collapsed or always-visible sidebars and more. 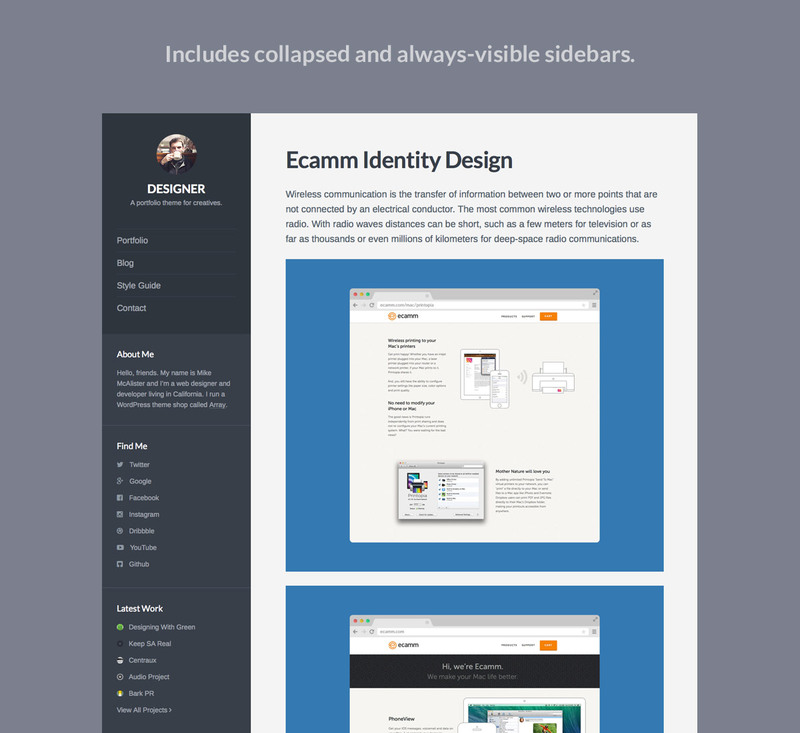 Designer also includes a minimal blog option, which complements Designer’s minimal style.